Getting a copy of a birth certificate usually requires contacting the Department of Vital Records in the state in which the birth occurred. Those born on a naval base outside U.S. territory will need to go through the American Consular Office. 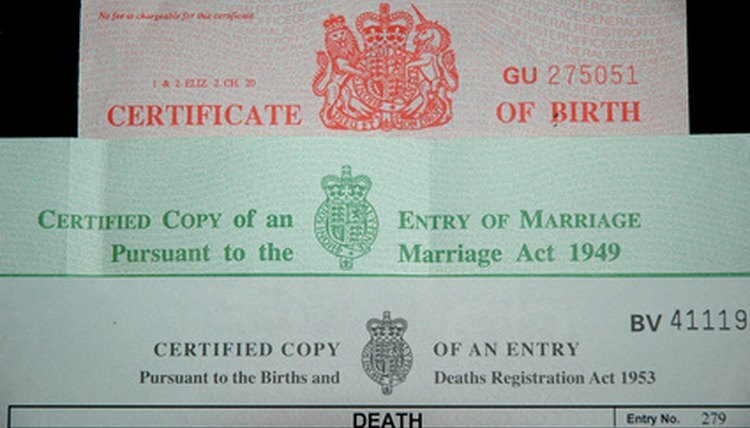 It can issue you a certified copy of your proof of birth. This document is also referred to as a Consular Report of Birth, or FS-240. Gather all the needed documents, and send your request to the Passport Services office in Washington, D.C. Note that only the person, parent or legal guardian will be allowed to obtain a copy. Write a letter specifically stating the request for the birth report (FS-240). Include the date of birth, the purpose of your request, the number of copies needed, and your current address and number. Include details about the birth child in question, such as all known names (birth, death, marriage and/or adoption), dates (birth, death and marriage), locations (birth, death and marriage), plus the mother’s and father’s names and the dates and places of their births. Add passport information including the name, issue date, date of inclusion and passport number. Include information from both the original passport used to first enter the U.S. and the current passport. Obtain a notarized affidavit for your FS-240 letter, and sign it. The affidavit needs to explain where the original FS-240 is located or what happened to it. It also must include the name, date and place of birth of the person. Contact the Vital Records Section at 202-955-0307. You can only request the record if it is your own, or if you are the legal guardian or parent of the person. Smith, John. "How to Find Birth Certificates From Naval Hospitals." , https://legalbeagle.com/6160718-birth-certificates-naval-hospitals.html. 15 April 2017.